The Design Language determines what language you will see multilingual values displayed in (such as field labels) when you view the Design tab in a form or reusable part. 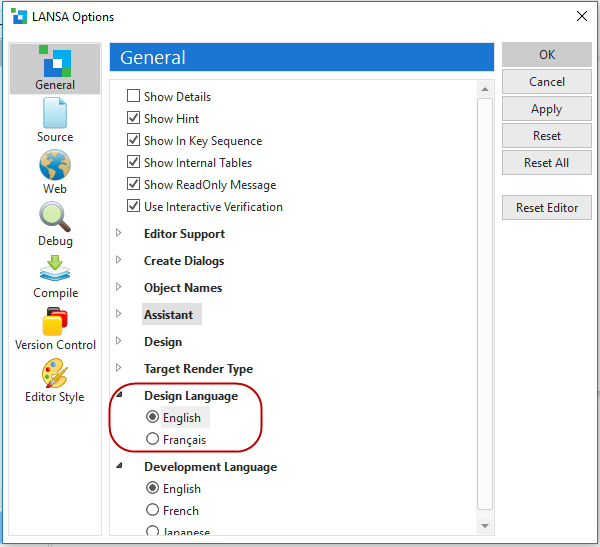 The Design Language can be changed as required by using the LANSA Options dialog as shown below. The Design Language is initially set to the Language used on the PC you use to log on to Visual LANSA. Note: The Design Language does not change the Language used to display descriptions and other information in the Repository tab. This information is based on the Current Language used to log on to Visual LANSA.